Here are the party goers for Jane's 3rd Annual Valentine's Party. Pictured is Jane, Sidney, Madeline, Sophia, Reagan, and Lily. This year I wisely decided to keep the guests to 6 (including Jane) and the time to 1 hour. Everyone was in a good mood this year and everyone had a great time! Funny face time. Reagan wins the prize for best funny faces; she has the greatest sense of humor! This year the girls made greeting cards from kits I found last year. The girls loved playing with the stickers and the glitter glue. Later they decorated cupcakes. Fun times! Here are the girls playing Hot Potato to take turns passing out their Valentines. They love playing the game and don't realize that it is an awesome way to enforce turn taking and crowd control. One of the best parts of the party was unplanned. The girls loved playing with Jane's sunglasses. So cute in their festive dress! Jane, Maddie, and Reagan lovin' it up! Family and friends should be receiving Teddy's birth announcement in the mail any day now. I think it turned out so cute thanks to the great photography of my brother in law Zachary and the software stylings of my fantastic husband. 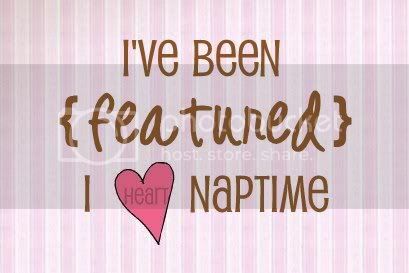 Isn't it great when those around you are aware of their great talents and put them to good use! 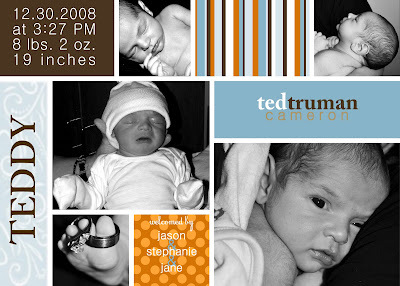 After being induced on December 30, 2008, Ted Truman Cameron joined us in the world! My labor was extremely easy... only 8.5 hours start to finish and 10 pushes. Ted weighed 8 pounds 2 onces (a full 2 pounds lighter than his big sister) and was born at 3:27 pm and was 19.5" long. I was crying with joy at the arrival of my little boy. I kept saying, "I can't believe it, I can't believe it!" Our journey to have Teddy was so extremely different than the journey to having Jane...it really threw me for a loop! Little Teddy is soooo cute! Turns out he looks a lot like Jane did at birth, except for a lot trimmer! Even though Jane was 10 pounds 2 onces, we didn't think she was chubby until we compared her with Teddy. Their faces are very similar but Jane deffinitly has her mom's ears and Teddy deffinitly has his dad's. Our nurse Cody was so nice during the whole induction including picture taking after. She held Teddy like this picture after picture trying to get one of Teddy with his eyes open. When he finally opened his eyes, he expressed his disapproval with the sweetest pout ever! So far he has been such an easy baby and so extrememly cute and sweet. Our family is so blessed to have him here!